…sung to the tune of “a hunting we will go”. 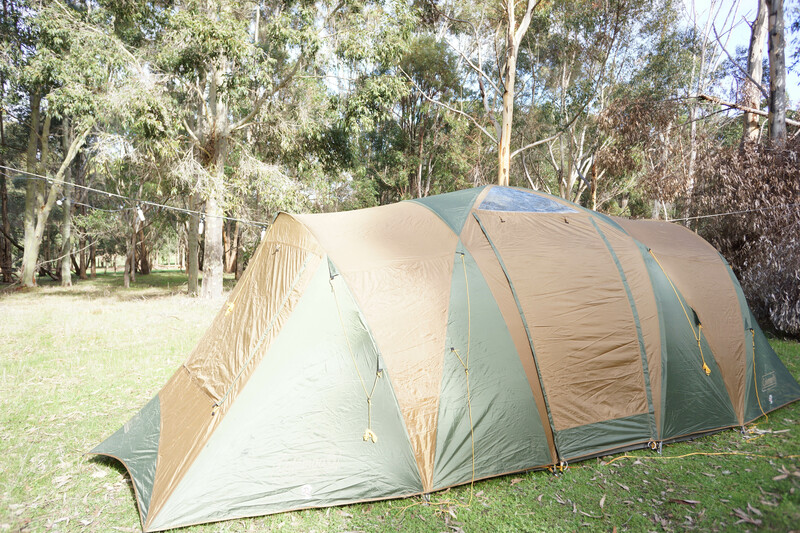 Believe it or not, none of us could remember the word “hunting”, we just had glamping in our heads. Took a while to remember it. We drove down to Margaret River last night, once Mark got home from work. 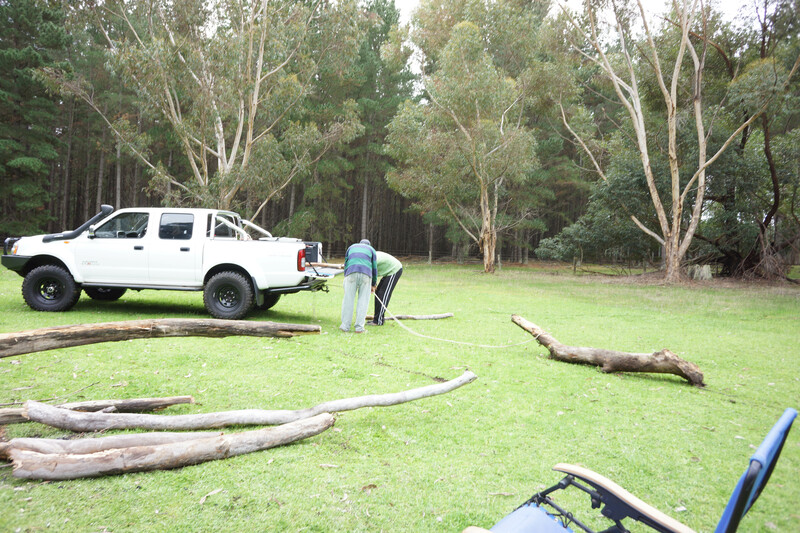 Mark set up the trailer whilst I flitted around doing, er, well not a lot really. 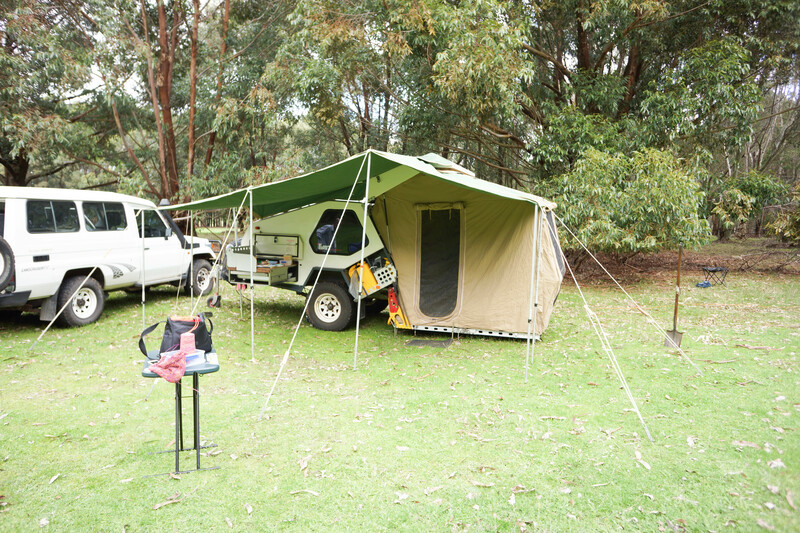 I obviously took photos because here is one of Mark putting up the verandah awning – see if you can spot him! with my knitting prominently in the foreground – yes, I’m going to risk my arm and have a go at handknitting again (it was that or bring a knitting machine with me!). 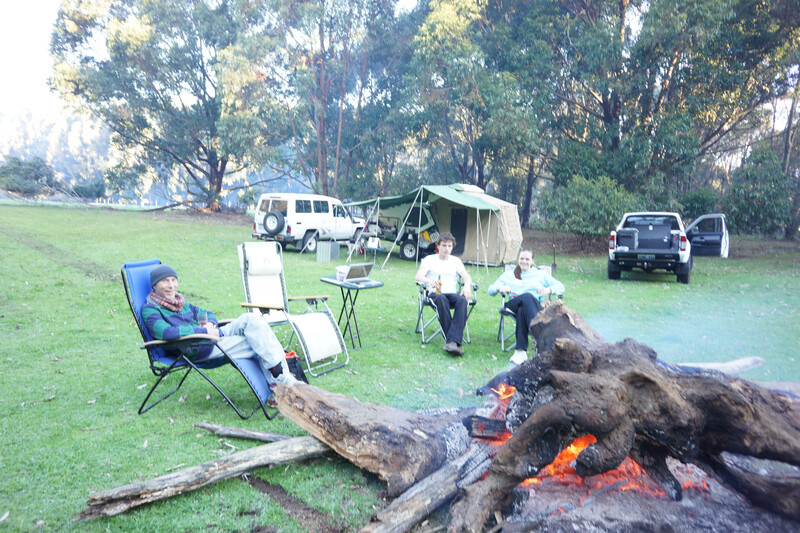 In short, no hardship is endured in the act of camping in this family! 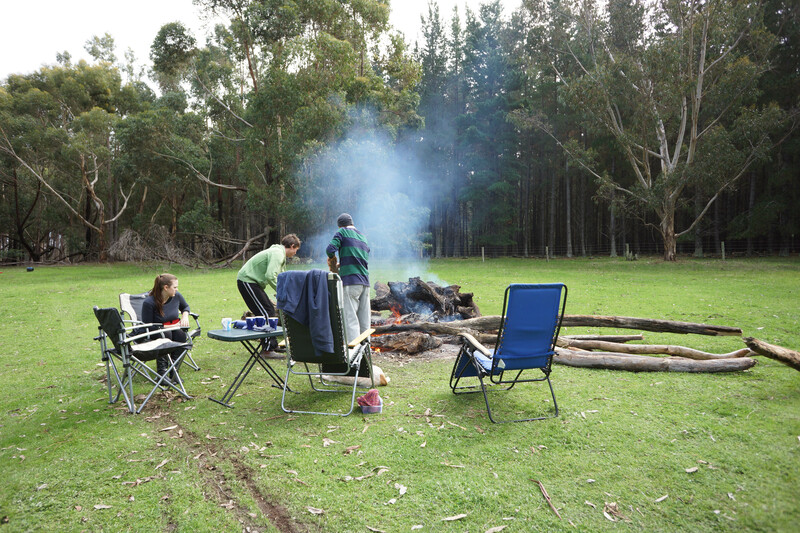 We had just set up camp when Tom and Bridgette joined us – such happiness. They are hardier (younger!) and set about putting up their tent. 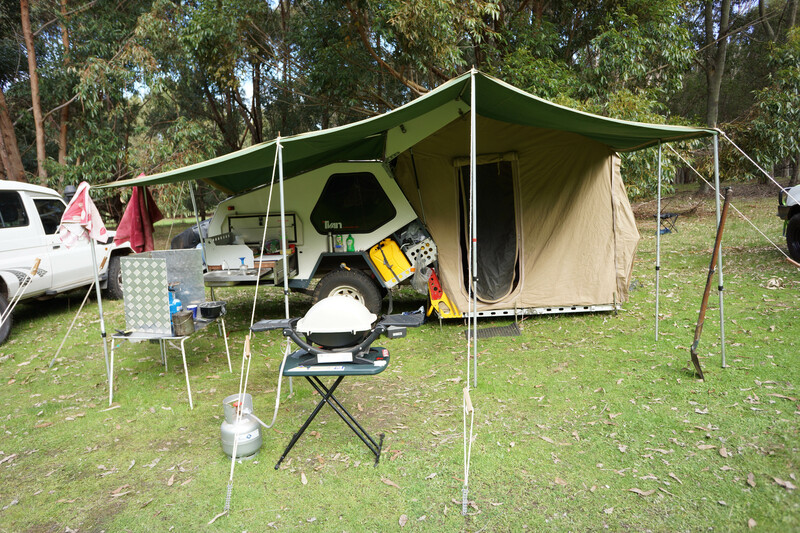 They fit into the glamping category because they have a 3-room tent with many home comforts. 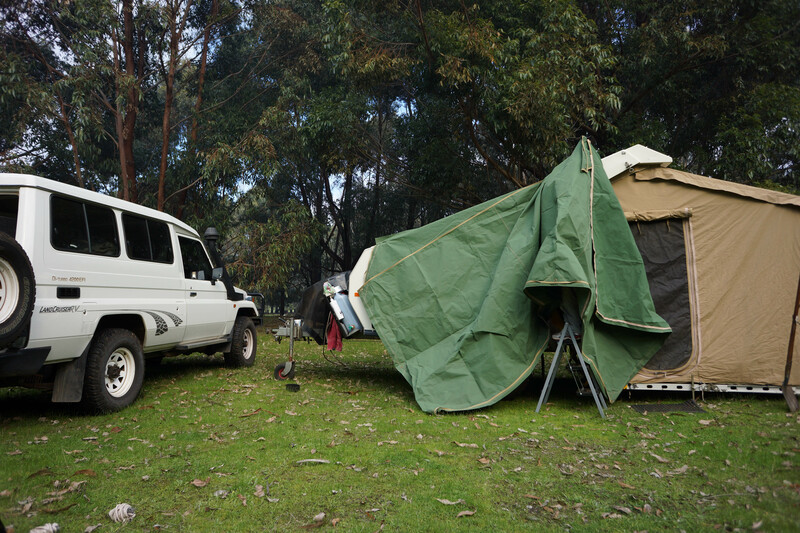 Tom is like his father, everything is organised, he has his camping equipment finely tuned and knows exactly how to pack it into his ute. 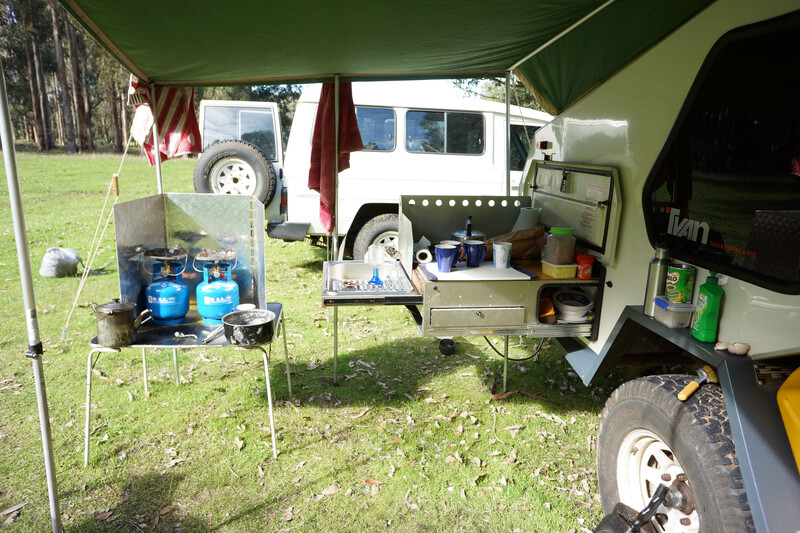 Archie, on the other hand, has a lightbulb moment – I need to go camping – empties the fridge, throws in some bedding and maybe some cooking equipment, and sets off. He is liable to leave things behind, such as warm clothing, or plates! A glamper he is not. 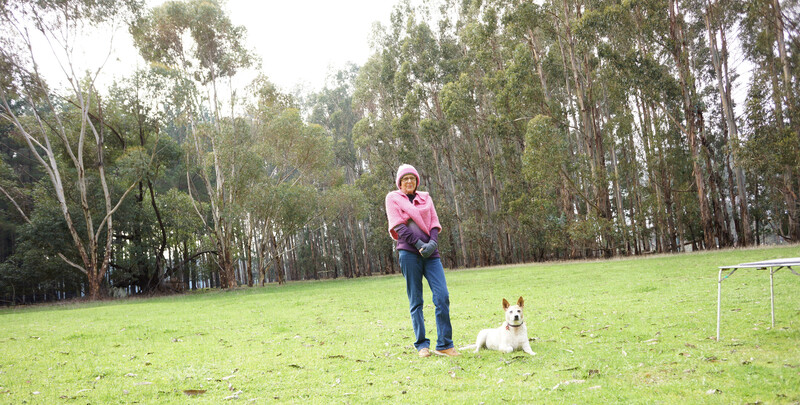 Speaking of warm clothing, it was freezing when we arrived. I managed a few me-mades, even though I am no longer a me-maiden! In this photo I am wearing fingerless gloves, a machine knitted beanie, machine knitted socks of Mark’s that felted in the wash, so are too small for him (but warm for me), and a mobius with integrated hood knitted out of some amazing pink yarn I bought on ebay. Yay, I think I’ve worked out how to make my photos bigger. I think they could be bigger still, but I’m on to it! 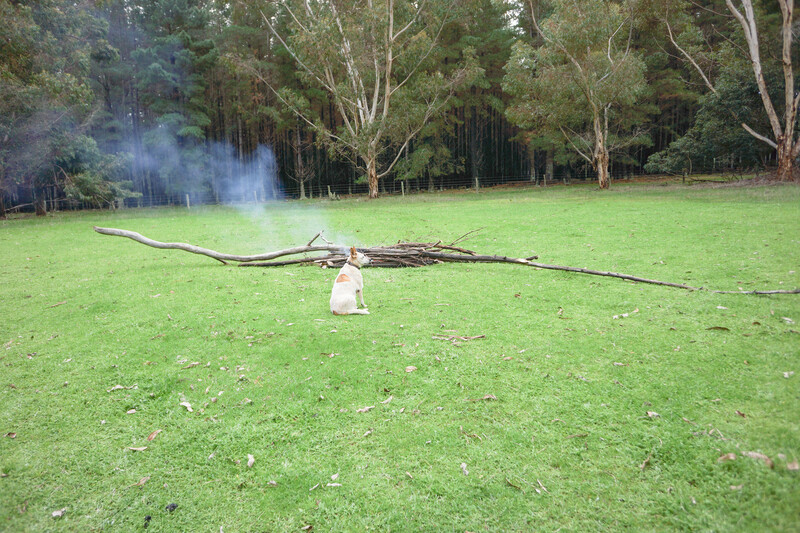 We got a bonfire going with some wood lying around – a pathetic effort, but the wood was wet… Roxie was doing her best to keep warm. 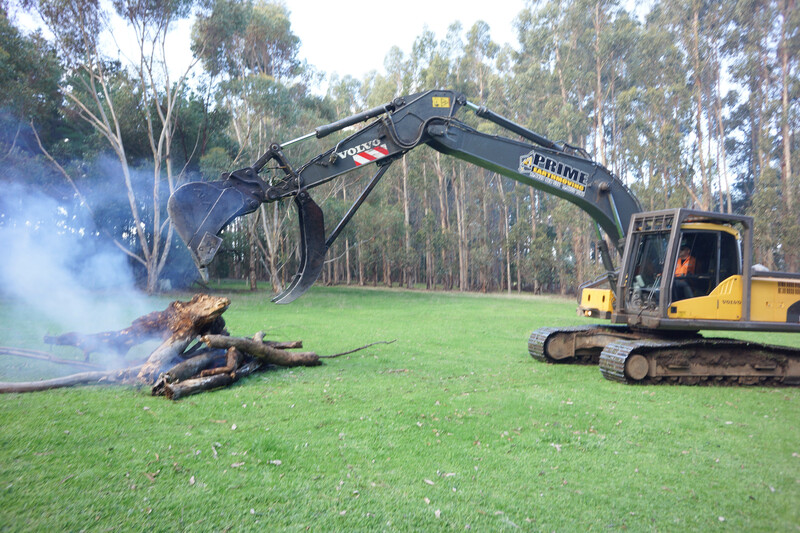 There was a guy working on the farm with some bulldozery thing with jaws – along he came with a massive great tree root and dropped it on the fire, and voila! instant toasty warmth! 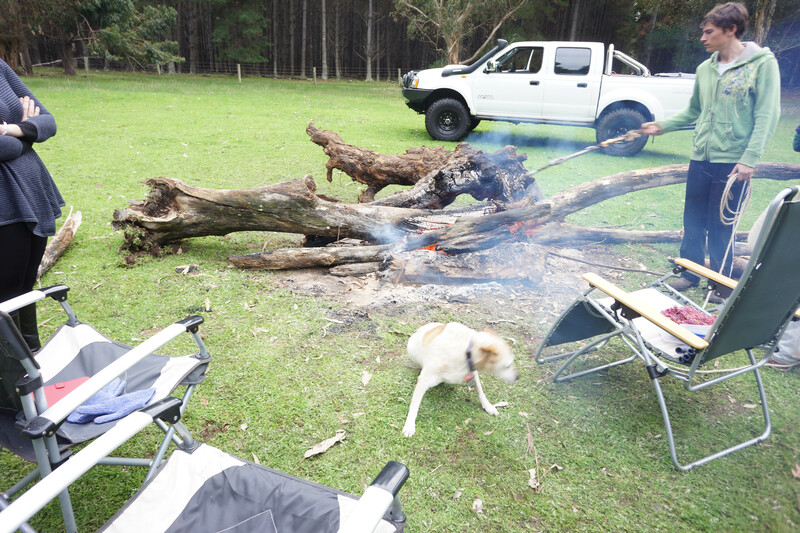 Dinner was held by the fire – we had a delicious chilli beef made in the Thermomix, but it had brewed chocolate added (crio bru). Absolutely delicious! A long walk under the stars, a game of yahtzee and we were all exhausted! Today we leaped out of bed early to hit the Margaret River Farmers’ Market. Much shopping for produce ensued and then it was home for breakfast – organic bacon, woodfired bread, etc, etc, yum! 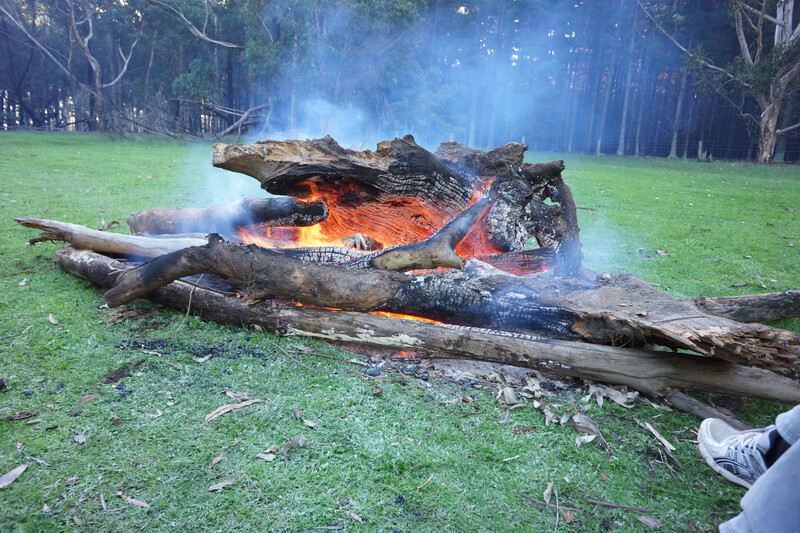 The men spend many hours tending to the fire, ensuring that the women are covered in ash at all times! 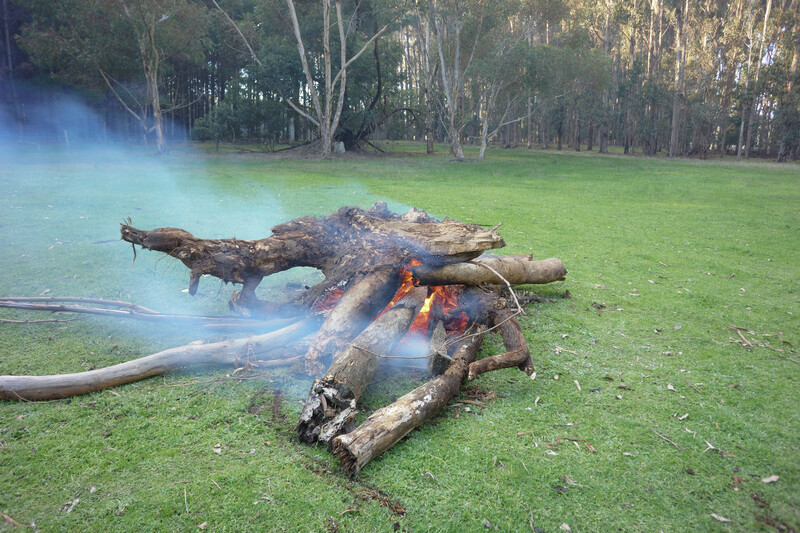 The fire now looks like something from the maws of hell and was so hot that we all had to gradually move our chairs back. 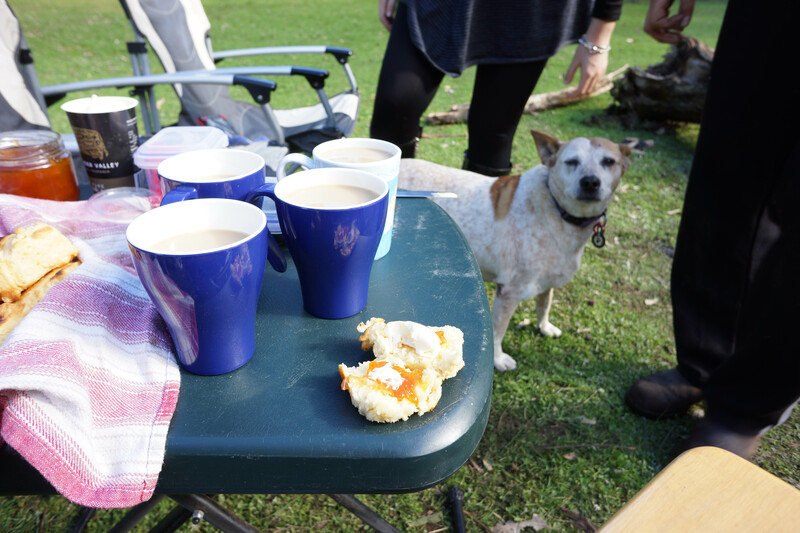 Morning tea was scones, jam, double cream, and cup of tea – watched over by Roxie, jaws at the ready for those crumbs! Lunch was whatever anyone wanted, but dinner is going to be a boned leg of lamb (bought at aforementioned markets), roasted with vegies, followed by apple and rhubarb crumble and custard. Weight problem anyone? Average: 23,222 – continuing to fall! 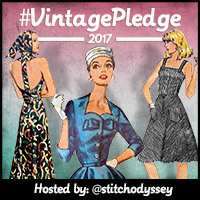 Next Post Weekend and other stuff.